Oh, who doesn’t love to embark on a journey that can recharge your soul? As you plan your travel, you shouldn’t miss out on the packing stage: the right things to bring with you, especially the little essentials such as jewelry. Bring jewelry pieces that you can travel with ease with. If you can travel with a meaningful and personalized necklace without worries, go ahead. It’s a link to your individuality and style anyway. Your wardrobe and jewelry is your own kind of fashion statement, so it’s essential to pack that favorite bling properly! ● Small plastic resealable bags come in handy for small items such as your rings. You can also pack each ring separately in small resealable bags. ● Another helpful organizer that can accommodate the size of your rings is a pill organizer. Since a pill organizer already has compartments, it will be easy to arrange your rings in them. ● You may also put your rings in one place by tying all of them in a ribbon or string. ● Small jewelry boxes meant to hold your rings are bulkier than the other options, but if you’re only bringing two rings, two small boxes won’t eat up too much space. ● Another foolproof method for packing earrings is by using buttons! Just insert them into the button’s holes. This way, it’s very easy to spot them without taking up too much space. ● You can also DIY an earring organizer using cardboard. Pierce your earrings through the cardboard in an organized manner. The advantage of this type of packing is that you can see all your earrings in a glance. It doesn’t take up much space either because cardboard is flat. You may also use a canvas cloth instead of cardboard. ● Lay your bracelets in a microfiber cloth and roll it. This method prevents the bracelets from getting tangled up, and the fabric is soft enough to protect the bracelets instead of damaging them. This is also a handy way to maximize luggage space. Just ensure that every piece is fully wrapped. ● Pack the bracelets separately using small resealable bags. The more delicate your necklace, the more chances of tangling when stored improperly. ● Pull the necklace through a straw to secure it, thus preventing it from tangling. Straws work best so long as the necklace can get through it. For chunkier types, you can use paper towel rolls. 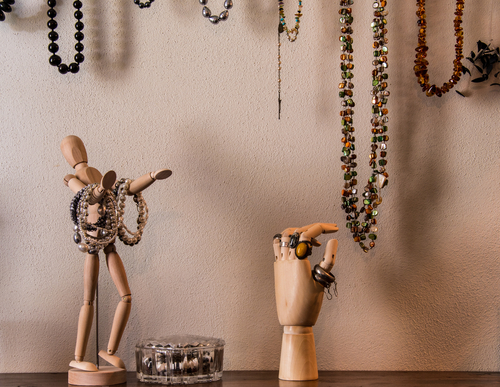 ● The method used in storing bracelets with a cloth is also applicable to necklaces. Lay the pieces in a cloth and roll it up to store in your luggage. ● Small plastic bags or pouches can also secure your necklace. ● Plan your outfit so that you can also plan the jewelry to match with it. This way, you can prevent bringing too many items for your travel. ● Take photos of your jewelry before you travel. This way, you can check if an item is missing. ● If possible, don’t bring expensive jewelry items as you travel as you may lose these tiny items. It’s better to be safe than sorry. ● Put your jewelry, especially the expensive or meaningful ones, in your carry-on bag. Your carry-on bag will less likely be misplaced or lost as you travel, so you won’t be filled with regret should an heirloom pendant gets lost. ● Invest in a good jewelry organizer. There are a number of organizers you can choose from. They range from the roll-up ones and pouch types to classic jewelry boxes. Of course, this depends on your taste and what works for you. 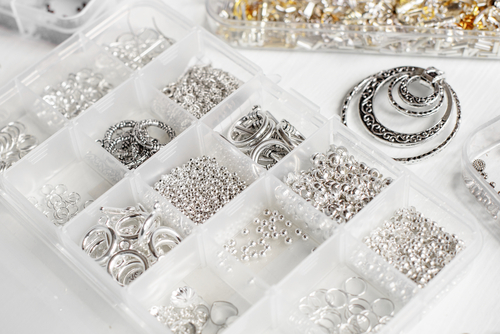 The DIY methods in organizing your jewelry greatly helps, too. Make sure you’re all set for your escapade. Slay your OOTDs during your travel by packing and organizing your jewelry well!